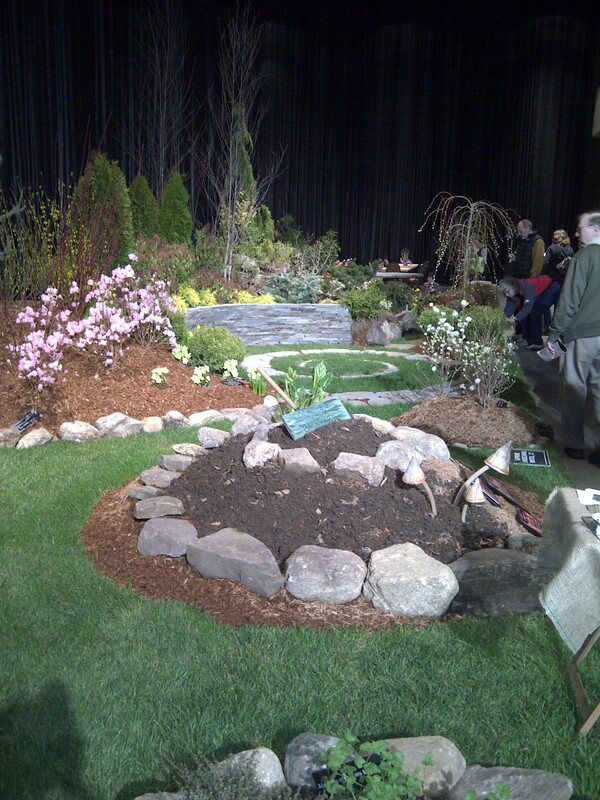 This is definitely going to be a 2 part post–and I’m only going to be talking about new things that I saw at the Hartford Flower and Garden show this year (held from February 20-23). Every year I see lots of trees forced into bloom, and bulbs and water gardening. To go to the Flower Show would be to believe that Hartford is the capital of water gardening in the northeast. I’m not sure why that is. Perhaps it’s because it’s easy to make a big splash in a relatively small space. In fact, my husband (aka The Spoiler for my newer readers) refuses to come with me anymore because “it’s all the same stuff.” And to an certain extent–the non-gardening eye–it is. But this year, more than ever, I was in need of a little horticultural therapy. So off I went. As with any good Flower show, there was turf and lots of it–and that’s nice to see when I can’t tell you how long it’s been since I’ve seen my own bedraggled lawn. Ordinarily I don’t care a bit about the lawn. But I was delighted to see some nice green grass–particularly just little bits of it here and there. This post is going to focus on the more interesting of the two trends I discerned from the show: the urban homesteading trend. It’s not that I think urban homesteading is so interesting (after all, I’ve been growing veggies where ever I can fit them for as long as I’ve been gardening. It’s nice to see the rest of the world joining me! )–it’s that it finally made it to a Flower & Garden Show! 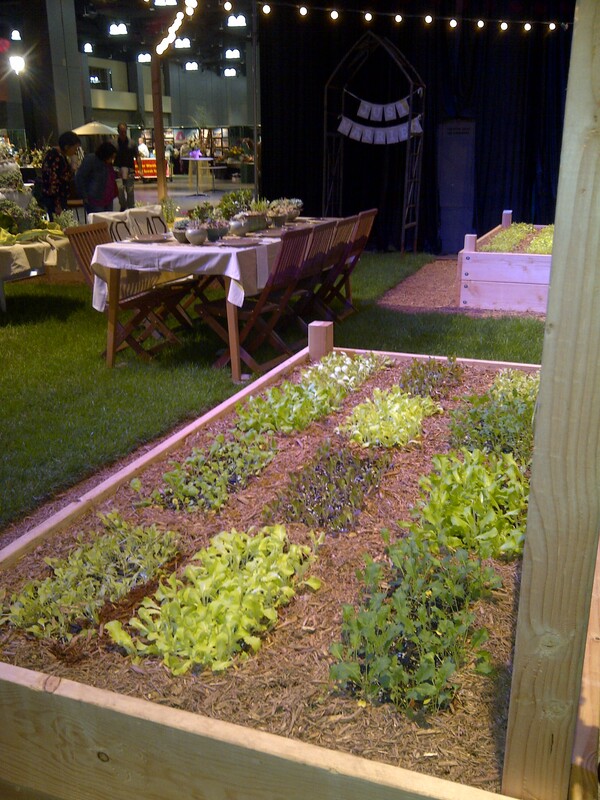 About half the exhibits had some edibles incorporated into them and some were solely edibles! There was this exhibit from a place called Perennial Harmony of Waterford, CT.
As you can see, their idea of dining al fresco means eating right in the vegetable garden! Notice the pots of herbs on the table. Diners can flavors their dinners with fresh herbs. Yum! Here is another of their raised beds. 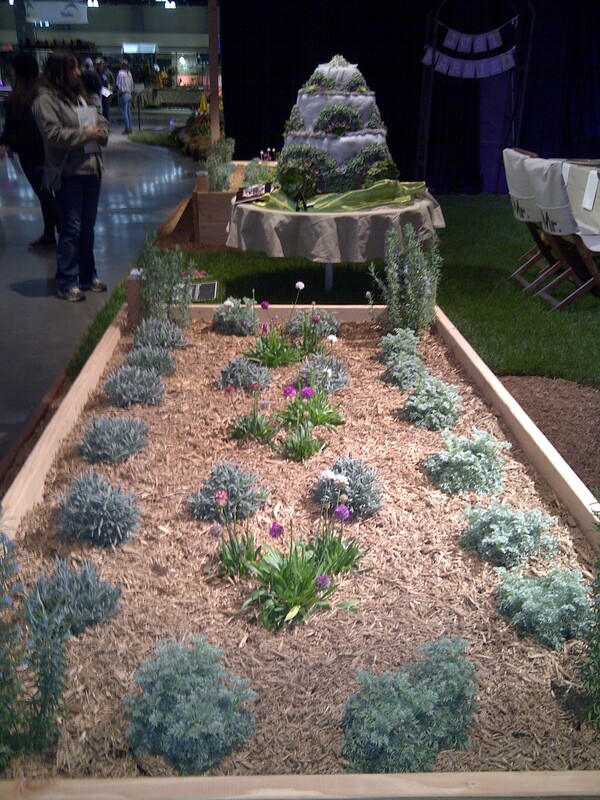 This one has some lavender, artemesia and chives–an herb bed instead of veggies. 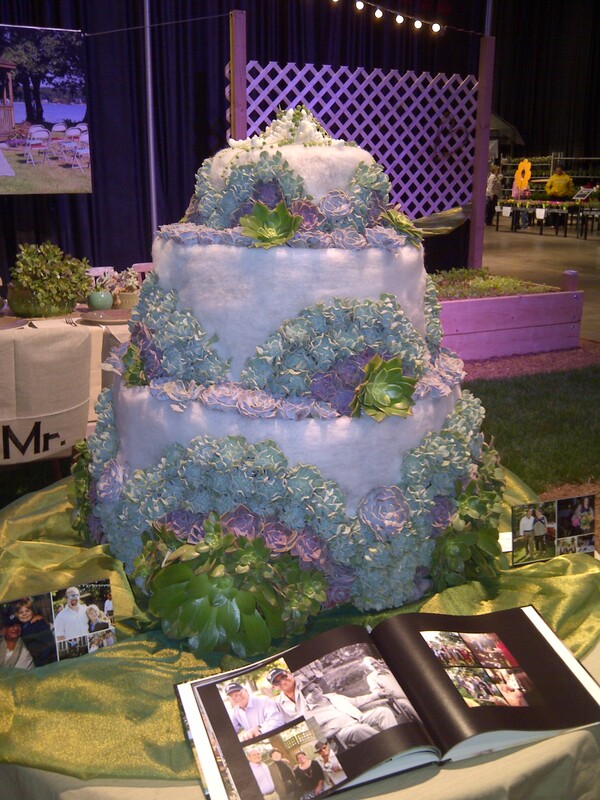 Finally this is their “succulent” wedding cake. 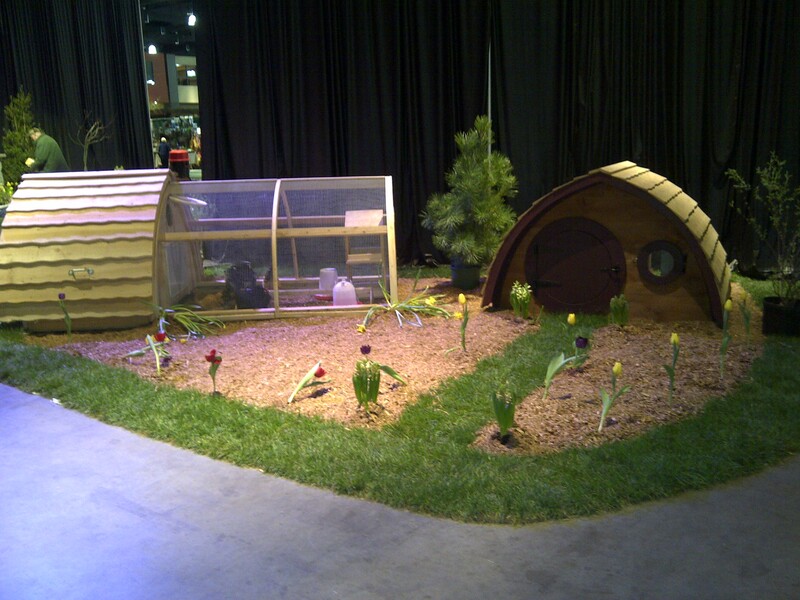 If this isn’t convincing enough–because this is pretty manicured–another exhibitor had backyard chickens! Urban homesteading at its finest. A third organic grower had a labyrinth made of lettuces. I do not have a photo because the lettuces were tiny. No slap to the grower–I surely wouldn’t have had large lettuces with the weather, sunlight and temperatures we’ve had this year! I applaud the grower for being at the show! Finally there was this herb display in a very formal landscape. The herbs are right at the bottom of the photo. I think you can just see the lemon balm. The bed that looks like just mud or dirt? That’s the compost pile. Pretty decorative, right? I’ll have more on this landscape on Friday. Previous Article When Is A House Plant Not Dead?